PetroThin is the ultimate thin section preparation machine. Examination of a thin section is an extremely powerful and versatile tool for quality assurance and development of new types of concrete, admixtures, fibers, or alternative raw materials. 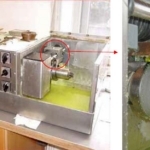 In forensic examination of deteriorated or damaged concrete, fluorescent thin section analysis is the fastest and the most reliable tool for describing and determining causes of deterioration or damage. The standard fluorescent epoxy impregnated thin section for transmitted light microscopy is only 20 m thick. 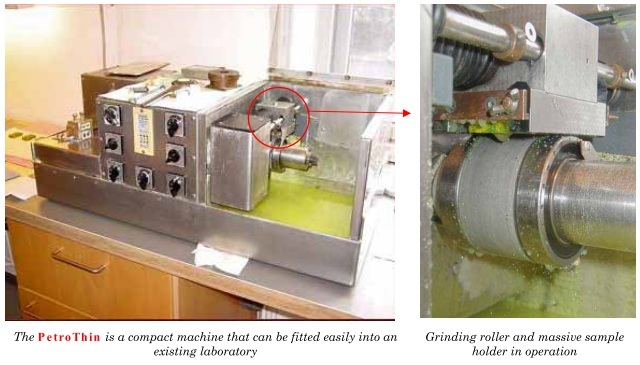 The process involved in preparing the 20 m thick slice of fluorescent epoxy impregnated concrete is extremely difficult using ordinary lapping equipment. PetroThin is the only machine in the world that can perform the required type of grinding on an inexpensive, rapid, and routine basis. The grinding guides on PetroThin use the surface of the glass slide as a reference for grinding. 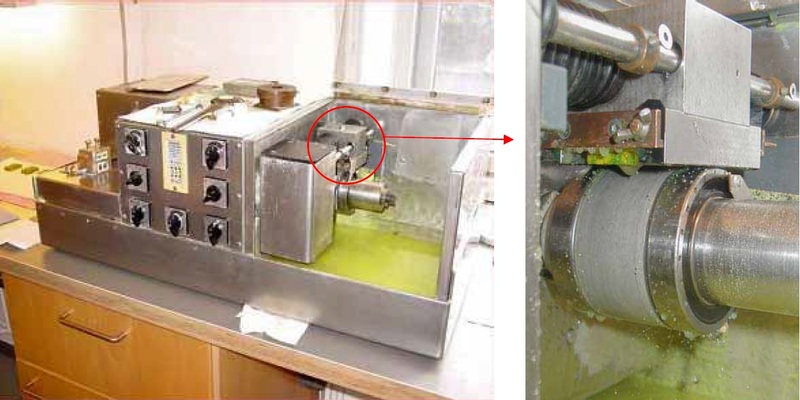 Thus, it is possible to prepare 20 μm thick slices quickly and accurately. The PetroThin has 30 years of proven track record with excellent results. The machine is easy and safe to operate. The training needed to operate the equipment and prepare thin sections in a consistent manner can be accomplished within one week. The standard thin sections produced on the PetroThin are 30 mm × 40 mm, but it is also possible to produce larger 30 mm × 70 mm thin sections. The PetroThin comes with a built-in diamond saw and a grinding unit. 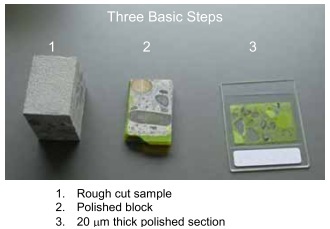 A 30 mm × 40 mm × 20 mm block of concrete is cut out of the sample. The block is bonded to a 30 mm × 40 mm piece of glass and it is trimmed on the diamond saw to a thickness of 10 mm. The block is mounted on the PetroThin and ground by the three successively finer diamond grinding rollers. The block is vacuum impregnated with fluorescent epoxy. When the epoxy has cured, excessive epoxy is ground off plus 7 m into the material. The block is glued by a UV-hardening adhesive to the final glass slide and excess material is cut off with the diamond saw. The glass slide is mounted on the traveling head of the PetroThin, and the material is ground down to a thickness of 20 m using three successively finer diamond grinding rollers. The thickness is controlled by checking the birefringence colors of quartz or feldspar particles using a polarizing microscope or by direct measurement with a caliper. Eventually, a cover glass is glued to the polished surface of the thin section. Alternatively, the specimen is polished if it will be used for scanning electron microscopy (SEM) or microprobe analysis. The PetroThin is simple to install in a laboratory or other suitable area. The PetroThin requires access to 380 VAC, cold water, and a vacuum source. Additionally, it is desirable to have access to a fume hood, drying oven, equipment for vacuum impregnation of the samples, and a rugged diamond saw for rough cutting of larger samples. Germann Instruments can provide all the necessary supporting equipment. 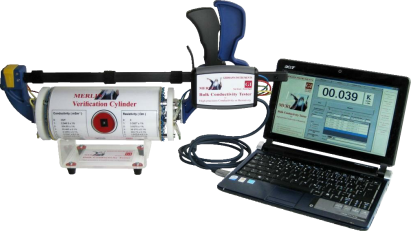 Germann Instruments will provide assistance in setting up the equipment and training technicians. Additionally, we will provide courses in concrete petrography, optical microscopy, and SEM/Microprobe analysis.